Need eBay Store Design and Matching Listing Template Design? Home » Blog » Check Out Beauty Chain’s New eBay Store and Template Listing Design! Check Out Beauty Chain’s New eBay Store and Template Listing Design! 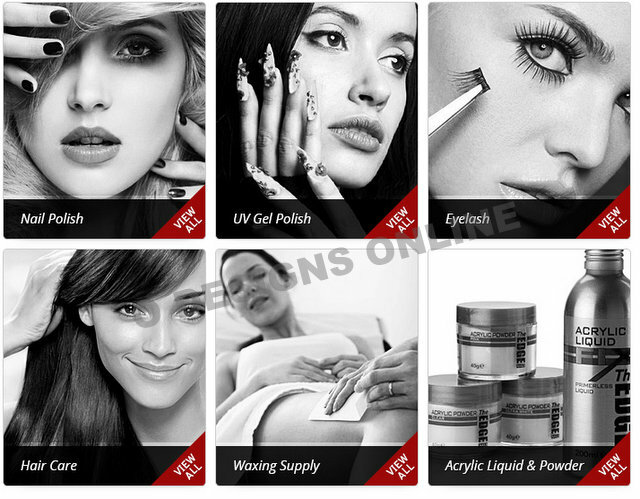 The Beauty Chain sells only brand name beauty and nail care products including those from OPI, Essie, Nail Harmony, Color Club, Kupa, MD Lash Factor, Tweezerman and more, but they still wanted to revive their eBay storefront and item listings. A quick connect with OC Designs Online and not only do they have a new eBay store design, they also have an awesome new listing template design that helps them build their brand and get noticed in the competitive world of selling beauty products online. When clients reach out to us, often they are aware of the essential eBay store design elements like tons of ways to navigate the store and search for products, but many are not aware of some of the other things you can do as far as design elements. This is just what we did for Beauty Chain with some rotating banners and a great “deal of the day” eBay store design feature that shoppers love. First we inserted their “butterfly chain” logo with their motto of “beauty connected” at the top left and to the right some recognizable why buys including the PayPal Verified badge, eBay Power Sellers badge and their 100 percent satisfaction badge—all of these offer comfort and trust to online shoppers. Next is the must-have top navigation bar where shoppers can learn more about Beauty Chain, browse new arrivals, ending soon and clearance items, contact the seller and read feedback. Beneath the navigation bar are the two elements we are so excited about—the deal of the day and rotating slideshow banners—each showing imagery and shop now buttons for eyelash products, nails, hair removal and hair products. Moving rotating banners keep shoppers in your store so these are great elements to have in your eBay store design. The Daily Deal reveals the deal as a “hot deal” and shows what time the deal is ending and a prominent “view the deal” red button. Next are four more great eBay store design elements and for the Beauty Chain, we aligned them for visibility—a search the store tool, an announcement on free shipping to domestic customers, hassle-free returns and an international shipping box. The side-by-side left store category navigation bar and featured product section allows shoppers to either browse by category with helpful sub-headings or go right to Beauty Chain’s featured products revealed with colorful and bright product images. 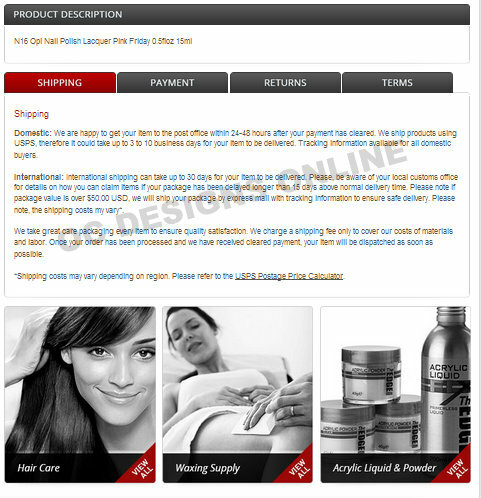 The next section of this eBay store design offers clickable boxes with product imagery by category including nail polish, gel polish, eyelash products, hair care essentials and the acrylic liquid and powder items they have for sale. This eBay store design is wrapped up with a place for shoppers to sign up for a free newsletter, the types of payment Beauty Chain accepts and a repeating logo to help build their brand on eBay. For the product listing template design shoppers are taken to an item—in this example, OPI nail polish and not only do they gain an easy to read description of the item, they are also able to view the item as if they never left Beauty Chain’s storefront. Along with enticing product imagery all of the important elements of the storefront remain—isn’t this a great idea for all eBay Power Sellers? Want your eBay store design to stand out like the Beauty Chain? Need a matching listing template design to help keep your brand strong? That’s our expertise at OC Designs Online so browse our portfolio and then request a quote to see how we can revive your eBay store! Don’t forget to find us on Facebook and Pinterest!